Moonraker (1979) is the eleventh spy film in the James Bond series, and the fourth to star Roger Moore as the fictional MI6 agent James Bond. The film, directed by Lewis Gilbert, co-stars Lois Chiles, Michael Lonsdale, Corinne Clery, and Richard Kiel. In the film, Bond is sent to investigate the mysterious theft of a space shuttle, leading him to Hugo Drax, the owner of the shuttle-manufacturing firm. Along with the space scientist Dr. Holly Goodhead, who later is identified as also being a Central Intelligence Agency agent investigating Mr. Drax, Bond follows the trail of clues from California to Venice, Italy, Rio de Janeiro, and the Amazon rain forest, and finally into outer space in a bid to prevent a plot to wipe out the world population and to re-create humanity with a master race. Moonraker was intended by its creator Ian Fleming to be turned into a film even before he completed the novel in 1954, since he based the novel on a manuscript he had written even earlier than this. 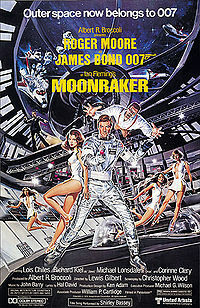 The producers of the James Bond film series had originally intended to do Moonraker in 1973 with Roger Moore making his debut as Bond, but the making of this movie was put on hold and it was finally released in 1979, coinciding with the rise of the science fiction genre in the wake of the Star Wars phenomenon. Derek Meddings, a long-time contributor to the James Bond series, was nominated for the Academy Award for Best Visual Effects for the special effects used in this movie and its space scenes. Moonraker was the highest grossing film of the series until the Pierce Brosnan Bond film GoldenEye. Moonraker earned a total of $210,300,000 worldwide — surpassing the preceding Bond movie The Spy Who Loved Me (1977). Moonraker was also noted for its high production cost for a Bond film, spending almost twice as much money as The Spy Who Loved Me.